I liked the way this stitch curled, so wanted to try motifs by combining with other stitches. 7.I started with working individual stitches to see the variation between this stitch and pistil stitch. then worked these individual stitches in a circle, then worked them with Algerian eye stitch, raised cross stitch and laced herringbone square. Detached buttonhole stitches are worked over scroll stitches in the last sample. 8.The first row is a combination of scroll stitch and chain stitch. 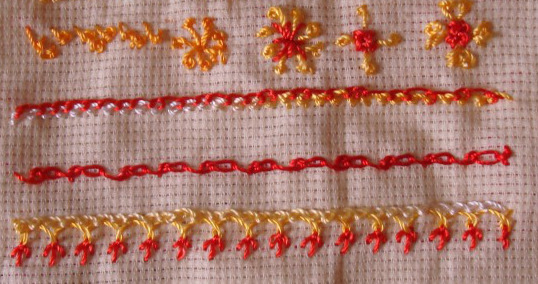 After working the scroll stitch and individual fly stitches, Pekinese stitch is worked between them in the last row. Though I couldn’t grasp the full potential of this stitch, scroll stitch is a very useful stitch and I am happy with these experiments. Today I experimented two rows of scroll stitches together. I was not able to achieve a braided look as suggested by Sharon because my stitches are still not neat. 4. In the first two rows I worked scroll stitches rows one below the other, though in the second row, I looped the thread through the previous row. In the third row three scroll stitches set are worked in two levels and I tried replicating it again, a failure! 5.In these samples scroll stitch rows are facing each other. I worked from left to right and returned back in the first sample. After working the top row left to right, I worked the opposite .that is, from right to left in the second sample. And to my surprise found that, I could control this stitch much better this way. Hurray! In the third sample, after working two rows of scroll stitches apart in my way, a thread was laced through both rows. 6. In the first sample, the scroll stitch rows are facing away from each other. 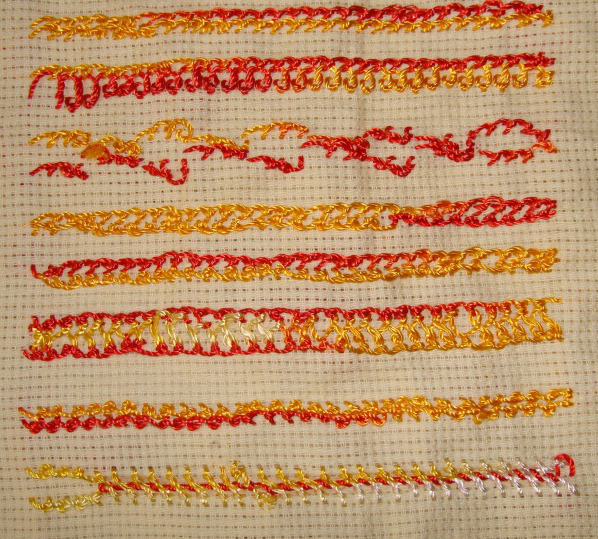 The same idea continues in the second sample which was later whipped with red thread. The last few stitches were not whipped to see the gap between two rows and how the whipping changed the look of the rows. This week’s stitch on the TAST 2013 challenge by SharonB is scroll stitch. Though I have come across this stitch on embroidery books, I have never tried this stitch. This challenge is giving me a chance to work this stitch. The tension and knotting are proving tricky at this stage. 1. These samples are trials of this stitch. The angle of the stitch in the first row, is downward towards left, in the second row, straight downwards and in the third row, downwards towards right. 2. I tried working this stitch with longer insertion and failed in the first row. Then I tried working this stitches closer by inserting in the next hole, in the second row, which needs some fine tuning. Then worked a row were the scroll stitches are alternatively apart and close. The double scroll stitches [closely worked] and single scroll stitches are alternated [sometimes forgotten!] in the fourth row. 3. This first row had to be detailed, otherwise I‘ll never be able to understand it! 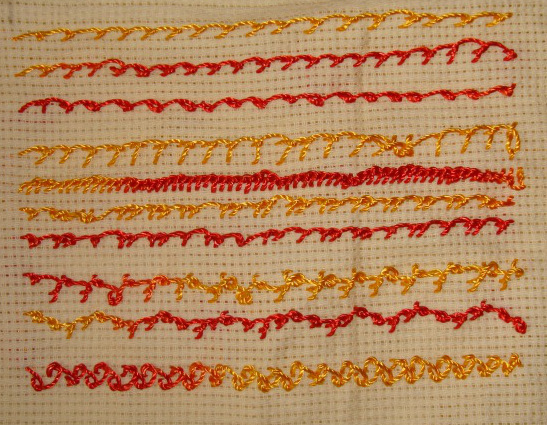 This is zigzag scroll stitch.in the second row, the stitches are worked at three levels to form a wave pattern. Detailing becomes important in the third row too. This is up and down scroll stitch, the stitches are slanted downwards and upwards alternatively.